Currently, early detection of the disease remains the cornerstone of breast cancer control. But mammography screening has come lately under fire with a series of articles questioning its benefits for women under 50 and for older women. As many, I got caught up reading those articles. 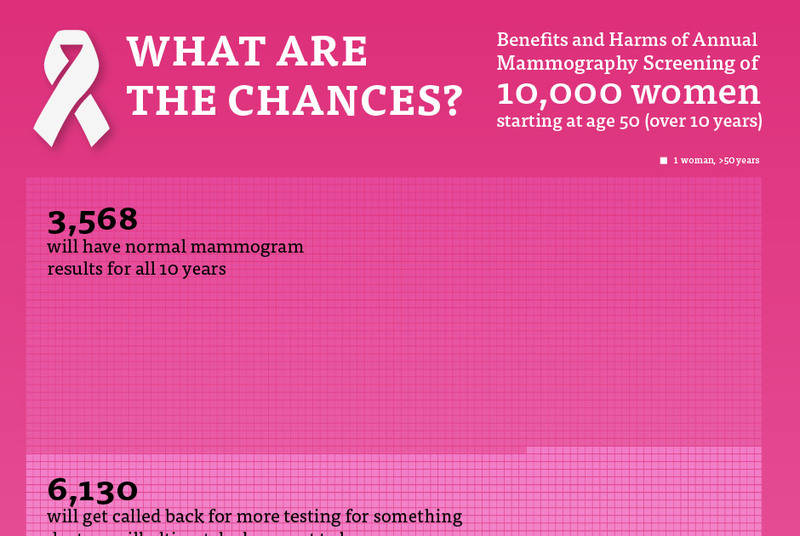 I found in the JAMA (Journal of American Medical Association) article by Dr. Jill Jin, MD, MPH an interesting read in which she puts together this graphic on the odds of various outcomes from mammography screening. Her article is based on a review of studies on the risks and benefits of mammograms earlier this year. I felt challenged to take the already good graphic present in the article and work on a new version to provide further a visual, realistic view of the breakdown in the six potential outcomes of mammograms. Thank you very much to Dr. Jill Jin for reviewing the infographic and wanting to make it a poster. Please read the articles for more information on the subject.